A kinetic model analysis was recently proposed to estimate the 18F-fluorodeoxyglucose (18F-FDG) integrated activity in an arbitrary tissue that uses tracer uptake and release rate constants. The aim of the current theoretical paper was to estimate 18F-FDG integrated activity using one standardized uptake value (SUV). A further kinetic model analysis allowed us to derive an analytical solution for integrated activity determination, involving both irreversible and reversible trapping. It only uses SUV, which is uncorrected for 18F physical decay (SUVuncorr, in g.mL−1) and is assessed about its peak value. Measurement uncertainty of the estimate was also assessed. In a tissue (volume V, in mL) that irreversibly traps 18F-FDG, the total number of disintegrations can be estimated as: Ã C = 162 * 105 * SUVuncorr * V * ID / W (ID, injected dose, in MBq; W, patient’s weight, in kg), where SUVuncorr is a mean over V and is assessed between 55 and 110 min after tracer injection. The relative uncertainty ranges between 18% and 30% (the higher the uptake, the lower the uncertainty). Comparison with the previous Zanotti-Fregonara’s model applied to foetus showed less than 16% difference. Furthermore, calculated integrated activity estimates were found in good agreement with Mejia’s results for healthy brain, lung and liver that show various degrees of tracer trapping reversibility and various fractions of free tracer in blood and interstitial volume. Estimation of integrated activity in an arbitrary tissue using one SUV value is possible, with measurement uncertainty related to required assumptions. A formula allows quick estimation that does not underestimate integrated activity so that it could be helpful in circumstances such as accidental exposure, or for epidemiologic purposes such as in patients having undergone several examinations. 18F-fluorodeoxyglucose positron emission tomography (18F-FDG PET) imaging has become indispensible for managing many diseases, either malignant or benign [1, 2]. However, in all nuclear medicine procedures, it is important to assess the absorbed dose deposited from internally distributed radionuclides. This assessment requires combination of integrated activity in source regions and of the so-called S values that relate mean absorbed dose in an arbitrary region to integrated activity in source regions [3, 4]. Since the level of irradiation induced by diagnostic examinations remains well below the threshold of appearance of deterministic effects, a degree of simplification can be accepted for absorbed dose determination. Tables of S values derived from anthropomorphic mathematical phantoms are given in MIRD pamphlets for various radionuclides and organs. Average integrated activity, i.e. the total number of disintegrations that occur from the time of tracer administration (zero) to (theoretically) infinity, or the mean residence time (ratio of integrated activity to injected activity), can be derived from healthy volunteer studies, or from a number of examinations in patients . ‘Model-based’ dosimetric approaches are usually considered as sufficient to deduce a first order estimate of irradiation induced by the nuclear medicine procedure . However, even in current clinical 18F-FDG PET imaging, getting a better estimate (i.e. more patient-specific) of the absorbed dose may be relevant, although the only available parameter for 18F-FDG uptake is semi-quantitative, i.e. the standardized uptake value (SUV) index. As an example, a first estimation has been made a posteriori by Zanotti-Fregonara et al. (Z-F) for an 18F-FDG examination accidentally performed during pregnancy [7, 8]. It could also be helpful for epidemiologic purpose such as in patients having undergone numerous examinations. A kinetic model analysis was recently proposed to calculate the integrated activity in an arbitrary tissue for 18F-FDG PET imaging, and its efficacy was demonstrated in the brain . That study used 18F-FDG uptake and release rate constants for grey matter and white matter, which were calculated from literature data involving dynamic acquisitions, i.e. involving several measurements . In comparison, the aim of the present theoretical work was to investigate whether an estimate of 18F-FDG integrated activity in an arbitrary tissue can be computed by only using SUV obtained from a single static acquisition. For this, an analytical solution derived from a kinetic model analysis was established, involving a population-based input function. This analytical solution allows determination of integrated activity that only uses SUV uncorrected for 18F physical decay (SUVuncorr) and assessed about its peak. A formula was derived that was compared to that of Z-F and its results for foetus, assuming irreversible trapping [7, 8]. Furthermore, estimates for healthy brain, lung and liver that show various degrees of tracer trapping reversibility and various fractions of free tracer in blood and interstitial volume, were calculated from this analytical solution and literature data, and were compared to results published by Mejia et al. . This work also assesses the measurement uncertainty of the integrated activity estimation that is related to required assumptions. where A Tot(t) is the whole 18F-FDG activity per tissue unit volume at time t (kBq.mL−1), which is corrected for 18 F physical decay (and includes trapped tracer and free tracer), W is the patient’s weight (kg), and ID is the injected dose (MBq). where ‘Σ(λCi/αi)’ is the input function AUC of the tracer (AUCIF; in mL−1). where SUVuncorr(t) is SUV that is not corrected for 18 F physical decay. It should be noted that the use of SUVuncorr(t peak) in Equation 7, i.e. the use of A Tot(t peak) instead of A Trap(t peak), involves the activity of both trapped and free tracer in blood and reversible compartment, the latter being related to F that was temporarily put aside in Equation 5.
where A Tot.uncorr(t peak) is the peak radioactive concentration (kBq.mL−1), which is not corrected for 18 F physical decay. Assuming irreversible trapping in our model, comparison with Z-F model, i.e. comparison of Equations 8 and 10, is equivalent to comparing two ratios, i.e. [AUCNIF / λC pN(t peak)] versus [exp(60λ) / λ], respectively. Note that the two models lead to a very close final equation when it is assumed that (a) tracer is trapped irreversibly and (b) tracer plasma decay is tracer physical decay, as shown in the Appendix. Model comparison. Curve (a) Trapped tracer activity (in arbitrary unit) versus time (in minutes) from Equation 3, assuming irreversible trapping, and the input function of Vriens et al. for 18F-FDG was used . Curve (b) (full line) Z-F function, i.e. ATot(t = 60) * exp(−λt) (the value for ATot(t=60) was taken from curve a). Curve (c) (dotted line) Z-F function with ATot(t = 84) (instead of ATot(t = 60)) that gives similar AUC for the two models. 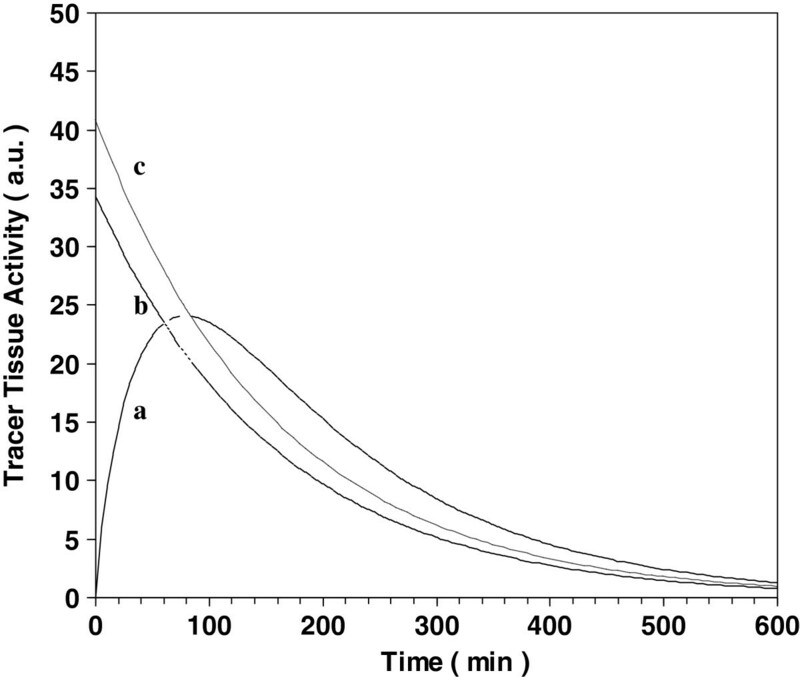 Curve a in Figure 1 also shows that when SUVuncorr in Equation 11 (or peak radioactive concentration ATot.uncorr in Equation 12) is assessed at t = 55 min or t = 110 min after injection, it is 5% lower than that obtained at peak time t = 79 min. Furthermore, Figure 1 compares the plots of the 18F-FDG TAC from Equation 3 (curve a) and of the function ATot(t = 60) * exp(−λt) from Z-F model (curve b). Curve b was plotted using the value of ATot(t = 60) obtained in curve a. The area under each curve is the integrated activity assessed from each model, respectively. Figure 1 visually suggests that the two AUCs are very close. This visual interpretation is confirmed by the comparison between the ratios [AUCNIF / λC pN(t peak)] and [exp(60λ) / λ], which only differ by 16%: 269 min versus 232 min, respectively. In this connection, the total number of disintegrations occurring in the foetus obtained from the present study and from the Z-F model  (SUVcorr(t = 60) = 4.5 g.mL-1, V = 21 mL, and 71-kg mother) is estimated to 14,720,000 and 12,623,000/MBq injected to the mother, respectively. Comparison between the [AUCNIF / λC pN(t peak)] and [exp(60λ) / λ] ratios further indicates that the two AUCs in Figure 1 would be equal if the SUV was acquired at t = 84 min after injection (curve c) (alternatively, the two AUCs can also be equal when a low 18F-FDG release occurs in the tissue of interest, resulting in a lower AUC of the tissue TAC and in a shift of peak time to t = 77 min, instead of t = 79 min). For healthy grey and white matter, which reversibly trap 18F-FDG, the [AUCNIF / λC pN(t)] ratio is 185 and 189 min, for peak activity at t = 61 and 63 min [9, 10], respectively. For the healthy brain, integrated activity was calculated from Equation 8, assuming that brain was 50% gray and 50% white matter, with 805-mL volume each (as 2.3% of a 70-kg patient, with a brain density of 1) [10, 16]. For SUVuncorr(t peak = 60) = 4 g.mL−1 (= (5.3 + 2.7) / 2, on average ) and ID = 37 MBq, the total integrated activity for healthy brain compares with that calculated by Mejia et al. : 7.97 versus 6.57 (±1.51) MBq.h . For the healthy lung, which irreversibly traps 18F-FDG, integrated activity was calculated from Equation 12 and experimental literature data . Assuming that lung volume is 1,120 mL (as 1.6% of a 70-kg patient, with lung parenchyma density of 1) , for ATot.uncorr(t peak) = 1.62 kBq.mL−1 on average (Table one in ), the total integrated activity for healthy lung compares with that calculated by Mejia: 0.93 versus 0.86 (±0.10) MBq.h for an administered activity (ID) of 37 MBq . For the healthy liver, which reversibly traps 18F-FDG, the [AUCNIF / λC pN(t)] ratio is 164 min, for peak activity at about t = 55 min (Figure two in ). Total peak activity is 8.6 kBq/mL, and hence SUVuncorr(t peak) = 1.7 g.mL-1, a value identical to that obtained by Minamimoto et al. . The total integrated activity was calculated from Equation 12, assuming that liver volume is 1,280 mL (as 2.0% of a 64-kg patient, with liver parenchyma density of 1) . The total integrated activity for healthy liver compares with that calculated by Mejia: 3.47 versus 4.14 (±1.09) MBq.h, for an administered activity (ID) of 37 MBq . This theoretical work showed that the calculation of an estimate of integrated activity in an arbitrary tissue using one SUV value, or using one radioactive concentration value (Equation 8 and 9, respectively), is possible. However, this estimation requires the following: (a) the use of a population-based input function , which is involved in the [AUCNIF / λC pN(t peak)] ratio (Equations 8 and 9) and (b) the use of SUV, which is uncorrected for 18F physical decay (either to the time of injection or to the beginning of acquisition) and is assessed about its peak value. The value of 18F-FDG release rate constant in the tissue of interest plays a role in the peak timing and hence in the value of C pN(t peak) (indeed, Equation 3 shows that the peak timing depends on the release rate constant, on the physical decay constant, and on the time constants of the 18F-FDG IF, whereas the uptake rate constant plays a role in the SUVuncorr(tpeak) amplitude). If the 18F-FDG release rate constant from the tissue is unknown, and hence if the SUVuncorr peak time is unknown, assuming that k R is negligible (i.e. an irreversible trapping) leads to an overestimate. In current clinical practice, this overestimate is more acceptable than an underestimate and can be very quickly computed as Ã C = 162 * 105 * SUVuncorr(t peak) * V * ID/W (Equation 11). The use of the semi-quantitative SUV index obtained from a single acquisition for integrated activity estimation requires assumptions presented above, resulting in different origins of measurement uncertainty. The measurement uncertainty that is related to the product ‘162 * 105’, i.e. related to the [AUCNIF / λC pN(t peak)] ratio, was estimated to be ±3.8%, i.e. the relative difference between the [AUCNIF / λC pN(t peak)] ratio obtained by using minimal and maximal inter quartile values for the time constants of the normalized 18F-FDG IF of Vriens et al. . Although this relative uncertainty is low, it is suggested that it could be still reduced by using, in each patient, a more specific IF adjusted with a single blood sample, instead of a population-based input function, as proposed by authors [14, 20]: in other words, Equation 7 could be used instead of Equation 8. Note that such a method could be applied in particular in hyperglycaemic patients, while SUVuncorr(t peak) (even if it is lowered owing to a high blood glucose level) should be used as such, with appropriate measurement uncertainty discussed below. First, in current clinical practice, a strict time delay between injection and acquisition cannot be always fulfilled to obtain SUVuncorr peak value. However, curve a in Figure 1 shows that trapped tracer radioactive concentration, and hence SUVuncorr, smoothly peaks at t = 79 min, and at t = 55 min or t = 110 min after injection, i.e. a typical acquisition time window, its value is 5% lower than that obtained at peak time. Second, SUV in itself involves a relative measurement uncertainty, which is the same for SUV either corrected or uncorrected for physical decay. In a recent study, de Langen et al. showed that SUVmax repeatability, and hence SUVmax measurement uncertainty, was significantly greater than that of SUVmean, i.e. SUV averaged over several voxels. Therefore, the use of SUVmean appears relevant for dosimetry purpose. It can be obtained over a tissue volume, exhibiting either homogeneous or heterogeneous 18F-FDG uptake, as well as over a volume of interest within heterogeneous uptake (in this connection, the brain that is built of white and grey matter may be considered as an example of heterogeneous uptake). The SUVmean measurement uncertainty can be estimated from Figure two C in De Langen et al. study showing a minimal-maximal repeatability of 13% to 30% (with 95% confidence limit), leading then to a relative measurement uncertainty of 9.2% to 21.2% (=13/21/2 to 30/21/2). However, it should be noted that the use of the SUVmax value over a tissue volume, instead of SUVmean, may provide an overestimate (that is more acceptable than an underestimate), and the SUVmax measurement uncertainty can be obtained in the study of de Langen . As a summary, for estimation of integrated activity from Equation 11: SUVuncorr may be averaged over the tissue volume and should be assessed between 55 and 110 min after injection. The total uncertainty of the estimate ranges between 18% and 30% (as 18 = 3.8 + 5 + 9.2 and 30 = 3.8 + 5 + 21.2, i.e. simply summing the measurement uncertainties of different origins, respectively), depending on the tissue uptake: the higher the uptake, the lower the uncertainty. To the very best of our knowledge, the only previously published analytical solution for estimating integrated activity from one SUV value was that of Zanotti-Fregonara et al. in the framework of foetal dosimetry. This is the reason why the present model was compared to that of Z-F [7, 8]. The results of the two models, assuming irreversible trapping, were found in very good agreement with only a 16% difference. It is suggested that this difference is very likely overestimated. Indeed, the model comparison indicates that the estimates would be equal if the SUV was acquired at t = 84 min after injection (comparison of the AUC of curve a to curve c in Figure 1). A 16% difference was found with SUV obtained at 60 min after tracer injection, but this time delay is that of the start of the whole imaging procedure and not that of the particular step of PET imaging that involved the tissue of interest (embryo). Zanotti-Fregonara et al. indicated that imaging was obtained from the base of the skull to the mid-thigh level (7 table positions, 3-min per position). If so, taking also into account the time duration of the CT, the actual time delay between injection and acquisition was very likely longer than 60 min, and hence closer to 84 min. As a summary, it is suggested that the agreement between the two models mainly comes from (a) the common assumption that SUV is assessed about the SUVuncorr peak and (b) that the 18F half-life somewhat dominates the decay of the trapped 18F-FDG TAC, as visually shown by Figure 1. Nevertheless, it is suggested that the main benefit of the proposed model over the Z-F model is that reversible trapping is also addressed. Furthermore, in the framework of foetal dosimetry, it should be noted that both models can only provide a rough estimate of the integrated activity, because several unknown factors may influence the 18F-FDG uptake by the foetal tissues. In particular, foetal blood glucose level depends on that of the mother because glucose molecules can pass through the placental barrier, and therefore it is reasonable to assume a similar fate for glucose analogue molecules like 18F-FDG molecules. However, a main limitation of the integrated activity estimation from the two models is that the foetal 18F-FDG IF may be different from that of the mother. In addition, it should be noted that the foetal dosimetry should also involve the bladder as a source region, because it is close to the foetus and it is filled with urinary 18F-FDG . Calculated integrated activity estimates were found in good agreement with Mejia’s results for healthy brain, lung and liver that show various degrees of tracer trapping reversibility and various fractions of free tracer in blood and interstitial volume. Healthy brain reversibly traps 18F-FDG and F is much lower than the ratio K / (λ + k R): 4.6% and 5.9% for grey and white matter, respectively . Healthy lung irreversibly traps 18F-FDG and F is not negligible in comparison with the ratio K / (λ + k R): 63% at peak time . Healthy liver reversibly traps 18F-FDG and F is not negligible in comparison with the ratio K / (λ + k R): 26% at peak time . Furthermore, it should be noted that neglecting reversibility of the 18F-FDG uptake in healthy brain and liver leads to an overestimation of integrated activity that can be approached by comparing the [AUCNIF / λC pN(t peak)] ratio obtained at t = 62 and 55 min to that obtained at t = 79 min (=269/187 and 269/164), which differs by 44% and 64%, respectively: the greater the release rate constant, the greater the overestimation. Furthermore, Mejia et al. assume a two-exponential decay for lung and liver TAC and a five-exponential decay for brain TAC that can be applied to experimental tissue data, respectively . In comparison, the present study assumes a multi-exponential decay of the tracer IF leading to an analytical expression for integrated activity (Equation 4) that involves the sum ‘Σ(λCi/αi)’, which is the AUC of the tracer IF. This sum is close to the sum expressed in the right hand side of Equation A4 obtained by Mejia , thus suggesting that for integrated activity estimation, assuming a multi-exponential decay of the tissue TAC should be implicitly connected to assuming a multi-exponential decay of the tracer IF. This theoretical work showed that an estimate of cumulated activity in an arbitrary tissue can be computed from an equation that involves the tissue SUV, which is used without physical decay correction and is assessed about its peak (i.e. SUVuncorr(t peak)). Furthermore, if the 18F-FDG release rate constant from the tissue is unknown, in other words, if peak time of SUVuncorr is unknown, this work shows that assuming an irreversible trapping leads to an overestimate. This overestimate is more acceptable than an underestimate and can be very quickly computed as Ã C = 162.105 * SUVuncorr * V * ID/W (V, tissue volume, in mL; ID, injected dose, in MBq; W, patient’s weight, in kg), where SUVuncorr is a mean over V and is assessed between 55 and 110 min after injection. However, this calculation requires assumptions leading to a relative measurement uncertainty for the estimate that ranges between 18% and 30% (the higher the uptake, the lower the uncertainty). It is suggested that estimating 18F-FDG integrated activity using one SUV value could be helpful in circumstances such as accidental exposure, or for epidemiologic purposes such as in patients having undergone several examinations. where SUVcorr(t peak) is SUV that is corrected for 18 F physical decay and that is assessed at the trapped tracer peak, which is t = 160 min, as shown in a previously published work . Comparison of Equations 10 and 15 shows they are very close except that SUVcorr is not assessed at the same time delay after injection, i.e. 60 and 160 min, respectively. We would like to thank the anonymous reviewer whose criticism improved the manuscript. EL conceived the model analysis, participated in the study design and coordination, and in the manuscript writing. MB participated in the study design, in the model interpretation and in the manuscript writing. JB participated in the study design, in the model interpretation and in the manuscript writing. RM participated in the study design, in the model interpretation and in the manuscript writing. All authors read and approved the final manuscript.